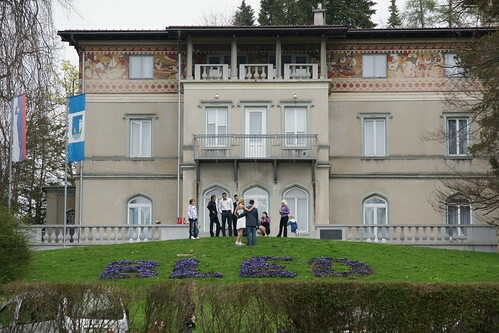 My first visit to Bled was in the Summer of 2004. The memories were vivid with the warm sun beaming down on makeshift stalls setup all around the calm lake. 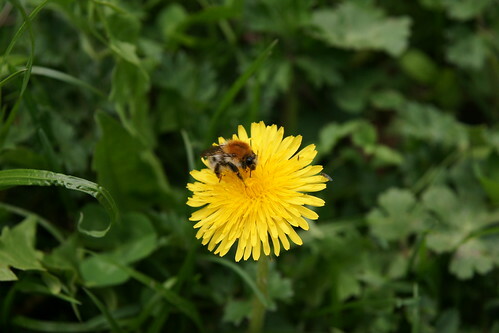 Colourful wild flowers were blooming on the grass plain with bees humming near pots of golden honey on sale. Almost six years later, I decided to make a return trip to try to relive the wonderful memories I always have for the place. The trip took us no more than 45 minutes and since Slovenia is part of the European Union, no passport check is required at the border. The weather report promised a sunny Saturday afternoon but when we arrived in the morning, the sun was still hidden behind the clouds accompanied by the occasional gusts of wind. 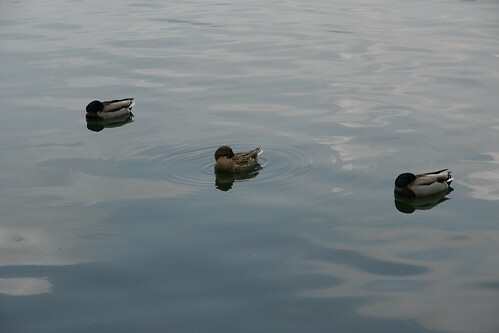 Nevertheless, with the beginning of Spring, wedding bells were ringing in the air, cafés were opened for business around the lake, strollers were busy licking away at their huge ice-cream cones and the ducks and swans were out begging for treats of bread crumbs or lazily napping away. For me, I chose to take in the grand view of the lake with a nice warm cup of hot chocolate in hand. 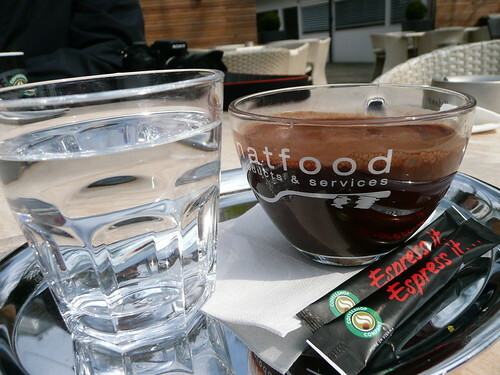 And just when I thought that hot chocolates tastes the same, I was in for quite a shock when I had mine served. It was rather thick and the first sip revealed a bitter sweet after-taste with a slight tinge of herbal flavor to it. My guess would be that melted chocolate was used instead of chocolate powder. But still, the herbal taste remains very much a mystery to me. The town of Bled is rather small with most of the main shops lined along one main street. 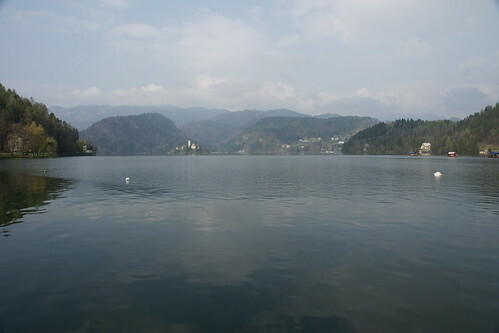 Besides the lake, the other not-to-be-missed 'attraction' in Bled - *drum roll* - would have to be Casino Bled. 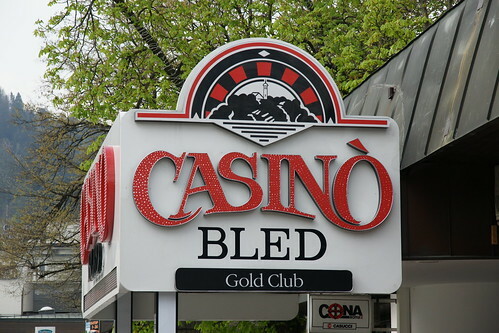 I find this to be a rather amusing name for a casino because for a casino to bleed would mean for the gamblers to win! But then again, it might take on the alternative meaning of bleeding the gamblers dry instead. 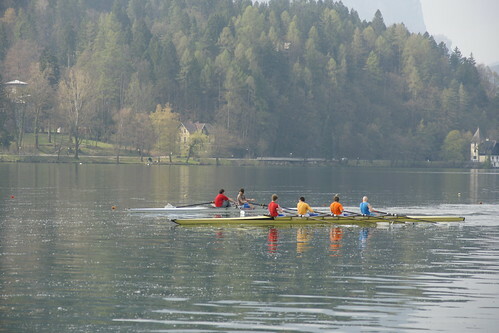 It was a pity that we came a week too early because on the following weekend, there is to be a rowing competition held in Bled. 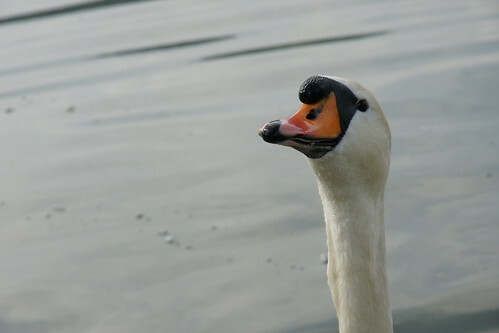 Nevertheless, we could see the laying down of the race routes with flotations on the lake and some teams were already training hard for the big day. 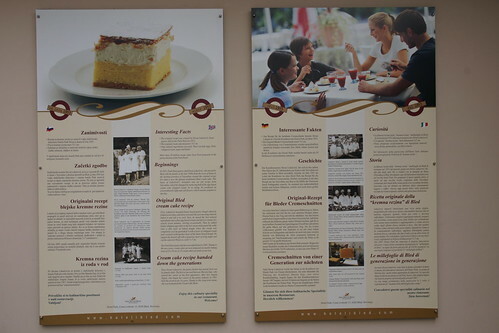 I only realised on this trip that cream cake is a speciality of Bled and Hotel Park was where the cake originated from. "...kneaded butter-based pastry dough which he folded seven times and left to rest until the next morning when he baked it and let it to cool. Next, he mixed up the best natural ingredients into a fine egg-based cream and left it to simmer for exactly seven minutes, stirring occasionally. Then he added firmly whipped egg whites to the hot cream and poured the yolks onto a thin layer of baked dough. Once the cream was completely cool he garnished it with a layer of whipped cream and covered it with another layer of the butter-based dough. 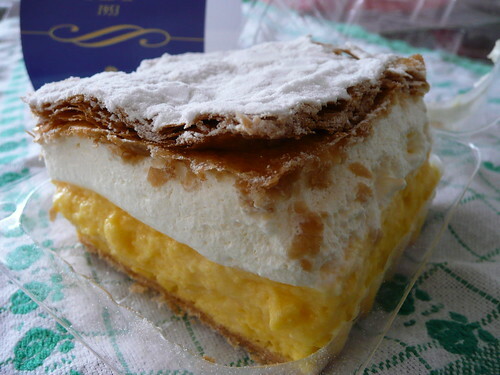 He finished the dessert off with a generous layer of icing sugar and cut the cake into 60 pieces, each 7 x 7 cm..."
I only purchased one slice for takeaway because I honestly thought that it would simply be a cake laddled with thick, fattening cream. It was only when I brought it out from the refrigerator the very same evening and had my teeth sink into the first bite that I knew instantly I was very much mistaken! The cream was so light and not as sweet as I thought it would be. Perhaps due to the refrigeration, the cream tasted a little like ice-cream too! 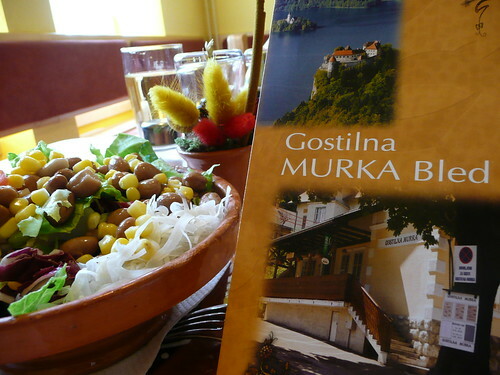 So now you know this is a must-try in Bled! 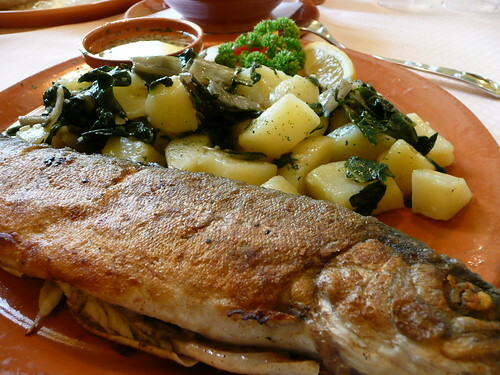 We ended the trip with lunch was at a traditional Slovenian restaurant, recommended by the local tourist information centre. It was just a short drive from the lake and we were the first customer of the day. 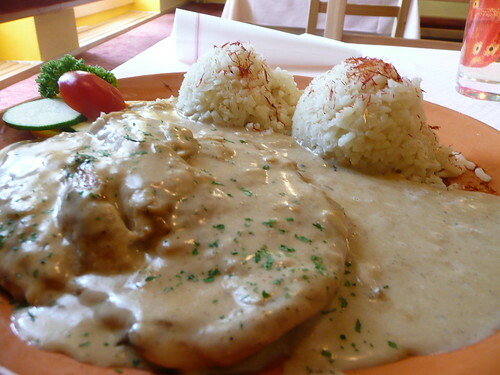 We ordered a simple mix salad to share and a main dish each comprising of the traditional Slovenian-style grilled fish and cream chicken breast with safron rice. The safron rice was quite a disappointment as the rice was a little on the soft side. 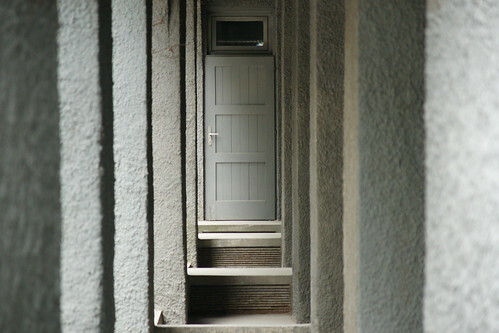 But I guess this might be the way the locals like it done as compared to the asians's preference. The most astounding of all would be the simple looking bowl of mix salad. The combination of vegetables with the right seasoning gave it a very refreshing bite! I could easily woof down the entire serving with no help rendered! All in all, this was a nice trip down memory lane - with new memories created but never replacing or recreating the old ones.